1. Address any water issues. 2. Install TWO sump pumps. 4. Capitalize on radiant heat. 5. Use decorative concrete to your advantage. 6. Put up radiant panels. A welcoming basement includes these six conscious choices. Before you do any work in your basement, you need to make sure you’ve noted — and corrected — any water issues. Poor-draining soil can cause dampness in your basement, but this can generally be controlled with a good humidifier. If you are in the construction stage, damp-proofing the home’s exterior of the foundation and basement slab also helps prevent this. Just a warning, this is usually expensive and typically requires professional installation, as it involves digging along the outside of the walls all the way down to the footing of your home. “Expect to pay at least $25 to $35 per foot of tile,” he adds. Most basements are inherently subject to flooding, and even the best-laid plans cannot eliminate the chance of flooding completely. However, you can reduce the impact of any water in your basement by installing a sump pump — and a backup sump pump. In addition to sump pumps, choosing materials that can handle moisture and getting wet is key to the longevity of your basement construction or remodel. By choosing your flooring carefully, and leaning toward inorganic versus organic materials whenever possible, you’ll reduce your risk. Your basement finishing materials should be completely inorganic so that even if water gets in, your floor, walls and ceiling will not be ruined. When you use organic materials in your basement, they will be susceptible to mold, mildew, rot, and even damage from dust mites and other critters. These products can decay and start to release moldy, musty odors into the air. It’s not pleasant. Instead, ensure your contractor uses quality, inorganic materials with a written warranty. “If you finish the area with the best basement finishing products the first time, you can have a remodeled basement that comes with a written warranty assuring that your basement will look beautiful for a long, long time,” says Total Basement Finishing. 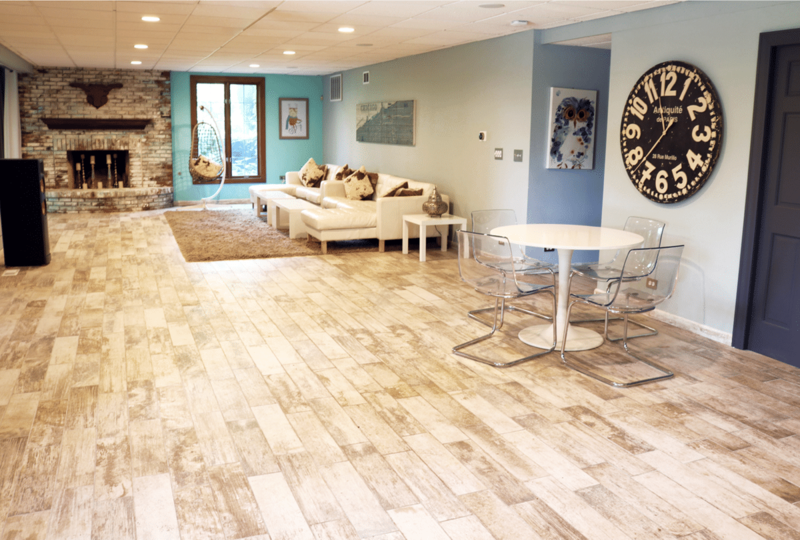 With a dry basement and the right materials on hand, you can cozy up a cool basement with the radiant floor heating offered by WarmlyYours Radiant Heating. Heat rises in your home, and because basements are generally underground, those floors are often the coldest place in the house. But you can expand your living space with in-floor heating. In-floor heating eliminates the chill in your basement and creates a center of warmth that radiates up through your home. WarmlyYours Radiant Heating provides radiant floor heating for virtually any floor type, including hard wood, carpet, laminate and luxury vinyl flooring. Some home owners may not be aware that it is possible to install in-floor heating under these floors, but it is. Cement floors are so stereotypical in basements. Gray, boring, beat up and uninviting. But your basement concrete floor doesn’t have to be. 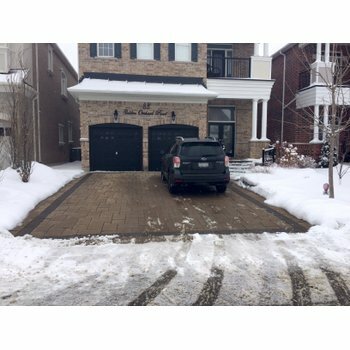 Search “stamped concrete” on Houzz.com for inspiring photos that will help you upgrade your expectations. Decorative concrete is a perfect base for WarmlyYours concrete heating cables and mats. 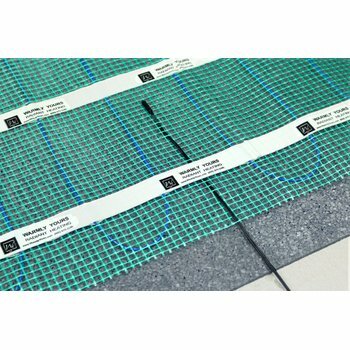 The radiant heating is available in cable form for maximum flexibility or mat form, which allows for quick and easy installation under concrete slab floors with the highest wattage floor heating product at 20 Watts per sq.ft. Either form creates warm, functional concrete floors and supplements your whole basement heating. This is one of the most powerful changes you can make to banish cold and gloom from your basement forever. If for any reason in-floor radiant heating doesn’t make sense for your basement, you can still utilize the power of radiant panels, which can be easily mounted on the walls to add extra warmth to your basement in a stylish way and add a countertop heater to bring warmth and luxury to your granite or stone countertops. With heated floors and radiant panels, you’ll never look at the basement as a cold, uninviting, uncomfortable area again. If you’re looking for a great way to expand your living space, increase the resale value of your home, or even just save money on your overall heating costs, radiant heating is a great way to do all of that. Whether utilizing in-floor heating or radiant panels, create heat and warmth from the bottom of your home to the very top with WarmlyYours. WarmlyYours is proud to offer radiant solutions designed to improve everyday living in every room — including your basement! Share your strategies for creating the perfect warm sanctuary for you and your family on the WarmlyYours Facebook page, or tweet us at @WarmlyYours. 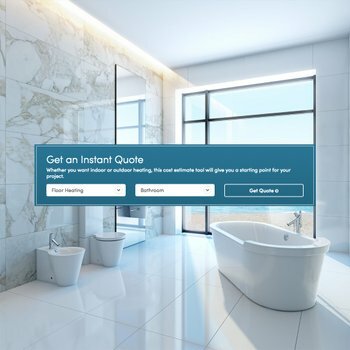 Use our WarmlyYours Radiant Floor Heating Quote Builder to see how much a floor heating system would cost for your basement. Under the heading, "CHOOSE ORGANIC MATERIALS ", concerning flooring, you say, "By choosing your flooring carefully, and leaning toward organic versus inorganic materials whenever possible, you’ll reduce your risk (of mold & mildew)." Then you quote Bob Villa, saying exactly the opposite of this: "use INORGANIC materials whenever possible." Confusing. You're absolutely right (nice catch! ), so we made a quick edit to clear things up. As I'm sure you gathered from the rest of the paragraph, inorganic flooring materials (like tile, some laminates, and Luxury Vinyl Tile) are the ideal choice for areas that have a high chance of exposure to moisture. Thank you for taking the time to help us clear up that confusion!